HPC Blog Another world record has fallen. Asian Student Cluster competitors have broken the student LINPACK record with an amazing score of 31.7 TF/s. This barely tops the former record of 31.15 TF/s set at SC16 by the University of Science & Technology of China. Weifang is a young university, established in 1984, and this is the first time they've sent a team to any student cluster competition. It's pretty remarkable to see a new team break an existing record right out of the gate like this. Impressive. So what put Weifang over the top? The first thing that jumps out at me is their configuration – they're driving a five-node cluster with a whopping ten Nvidia P100 accelerators. While there are several teams using eight P100s, Weifang is the only team to sport ten of these compute monsters. Again, it's very surprising to see new teams do this well on any component of the competition, much less establish new records. 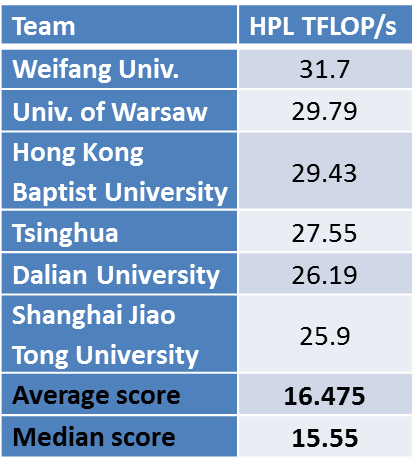 Both Weifang and Warsaw are teams to keep an eye on – we may be seeing the rise of a couple of new tier-one teams. Hong Kong Baptist nailed third place, finally breaking through into the top echelon – at least as far as LINPACK goes. They've been knocking on the LINPACK door for the last few years and it's finally opened for them. Like the other top finishers, their cluster is on the small side, just four nodes and 512GB memory, but driven by eight P100s. As you can see by the chart above, this new record isn't a huge advance over the mark set at SC16, but, hey, it's a world record and certainly worth bragging about, right? I'm hoping that the residents of Shandong province greet the returning Weifang team with a parade and statues built in their honour. It's the least they can do for these brave cluster warriors. Stay tuned for more ASC17 coverage. We'll have more results, interviews with the teams, and a complete and comprehensive analysis of the final results.